Well despite my best intentions to make butter chicken and such on Friday evening I completely failed (well I didn't fail - I won...at having a nap *Always look on the bright side of life*). However, this lead to the inevitable conversation with the husband of what to have for sustenance. We debated for a while but then I figured I could make something fairly easy with stuff in the kitchen. Sure enough, we have tons of pasta and I had frozen shrimp on hand so I decided to make Spaghetti with Lemon Garlic Shrimp. 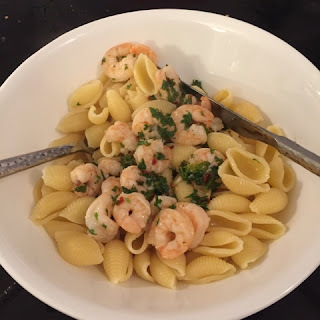 The only difference is that I didn't use spaghetti as the husband had requested that I use Rotini -but I didn't have enough so I made some shell pasta as well. Note I always start by preparing my ingredients (mincing garlic etc.) but before I make the sauce I start with cooking the pasta. Depending on how long the pasta takes to cook will affect when I start the sauce - I find the sauce/shrimp takes about 5 minutes at most and I don't like it sitting on the stove because the shrimp continues to cook. So I aim to have the pasta done about a minute or so before the sauce is finished so that I can drain the pasta and then add to the sauce right away. Fill a large pot with lightly salted water and bring to a rolling boil over high heat. Once the water is boiling, stir in the past and return to a boil. Cook the pasta uncovered, stirring occasionally, until the pasta is cooked through (see the package directions). Melt the butter and olive oil in a large skillet over medium-low heat. Stir in the garlic and cook until softened (be careful you don't want the garlic or butter to brown because then the sauce will take on a nutty taste which isn't great with this dish). Add the shrimp, white wine, lemon juice and red pepper flakes. Cook and stir until the shrimp is no longer translucent in the centre. Stir in the black pepper, parsley and lemon zest. Toss with the pasta.